The Bristol Mountains ~ "The Heart of the Mojave"
On my way home from looking for meteorites at Franconia last year I spotted an area south of I-40 that looked like good meteorite hunting terrain; it appeared to be weathering hills and ridges with plenty of desert pavement surfaces that would be great to swing a metal detector over. I marked it on my gps and planned to return in the future when I had a detector to check it out a little more up close and personal. Well I finally got that detector and made my way back out to spend a Saturday hiking around. 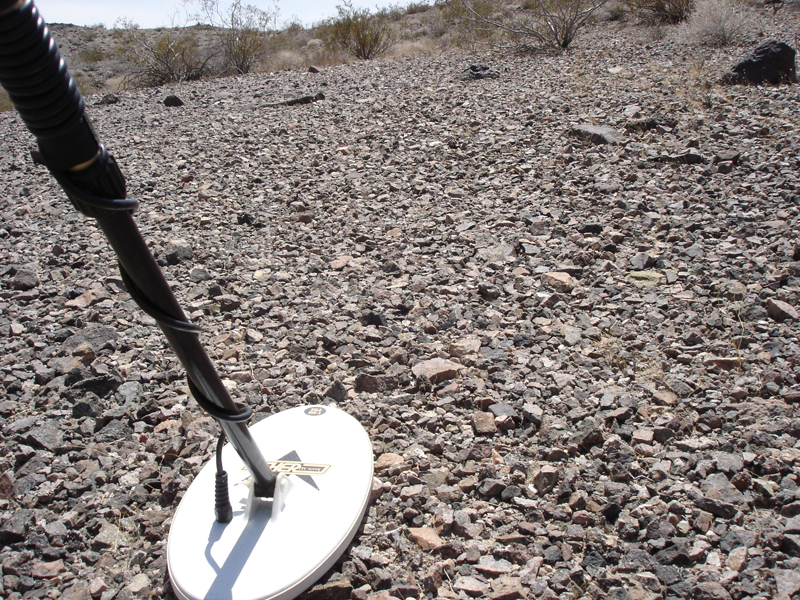 This was going to be my first time looking for meteorites with a metal detector and I was really looking forward to it. 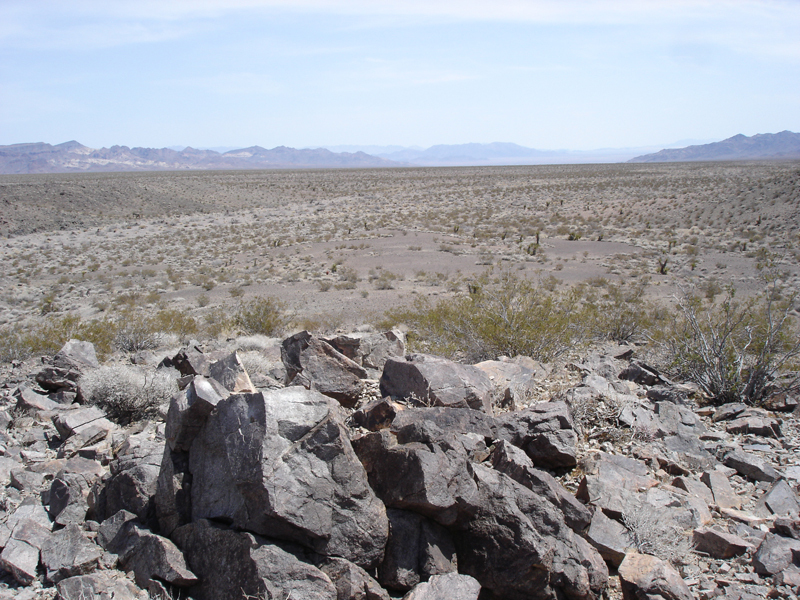 In researching the area I learned that there were copper, silver, and gold mines in these parts over 100 years ago, so who knows what else might be sitting out there in the rocks waiting to be found? 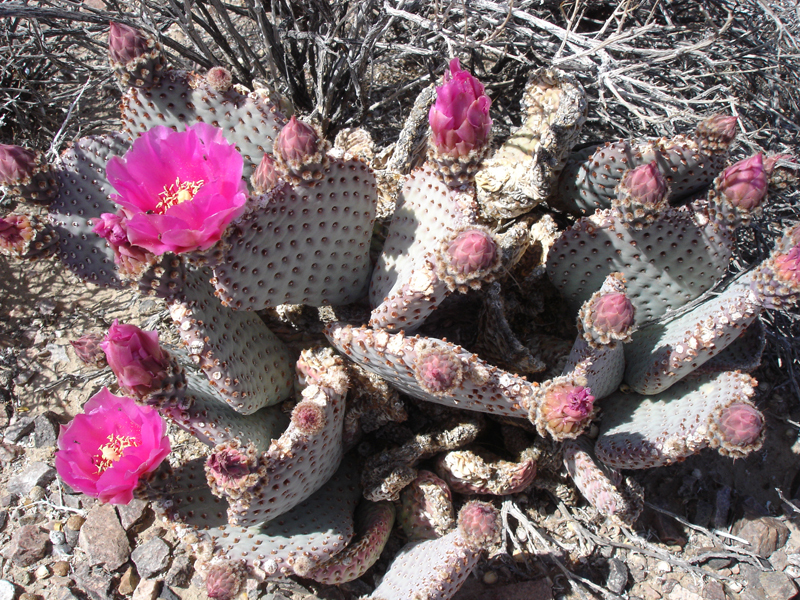 I exited I-40 and headed south a short distance, then turned off the pavement and headed deeper into the desert. 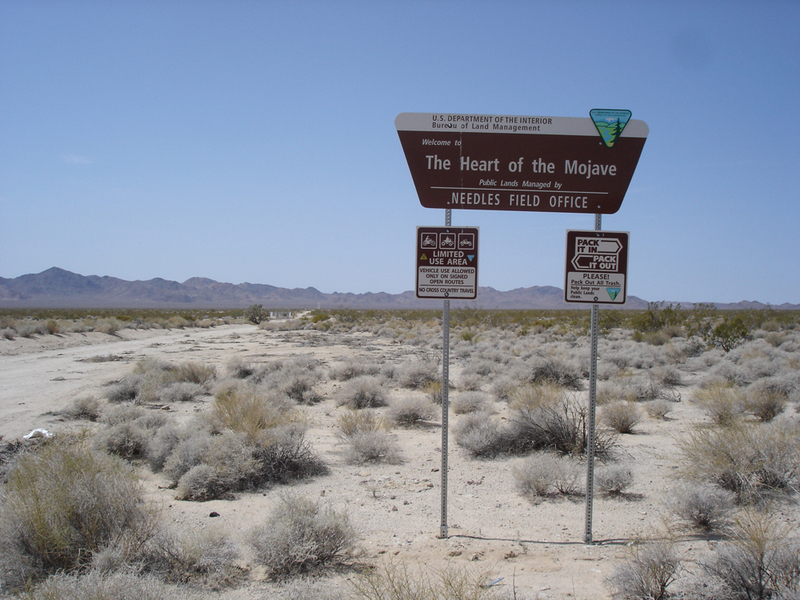 If you were to go north from I-40 here you would find yourself in the Mojave National Preserve. I'm pretty sure you can be fined for just having a metal detector in your vehicle there, so make sure you check your maps before heading out! The first several miles are along a well maintained dirt road, any 2-wheel drive vehicle could drive it just fine. Eventually I hit the mark on my gps that guided me north along another BLM route, this one following a wash up into the hills. High clearance 4-wheel drive is needed for the next couple miles, the bottom of the wash is very soft in places and washed out in others - go figure! I got to the spot on my gps I had picked to park, put on my snake gators, and ground balanced the detector. I had played around with ground balancing in my back yard, and it was just as easy to do here. 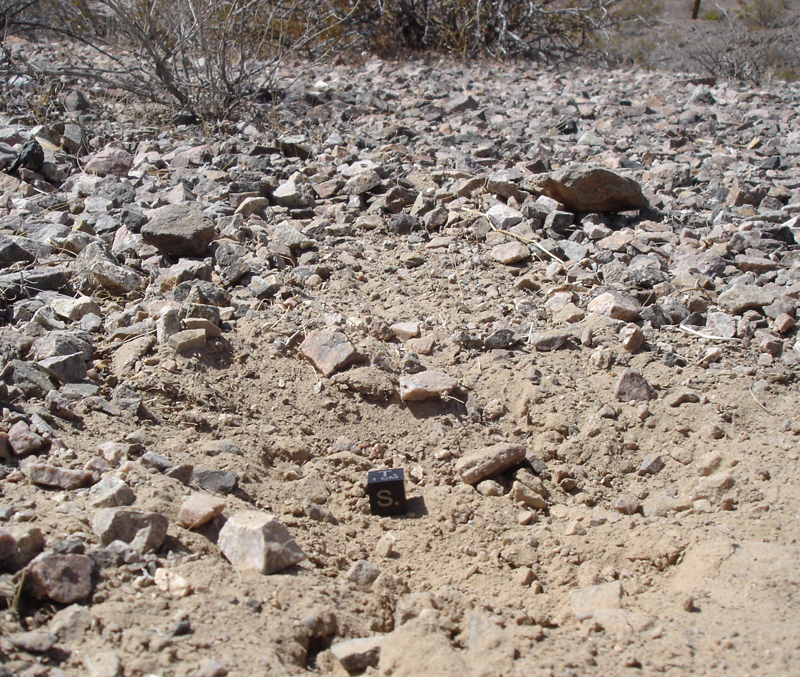 I brought an unclassified NWA chondrite with me to use as a throw down, and after my detector hit it just fine I was ready to start hunting. 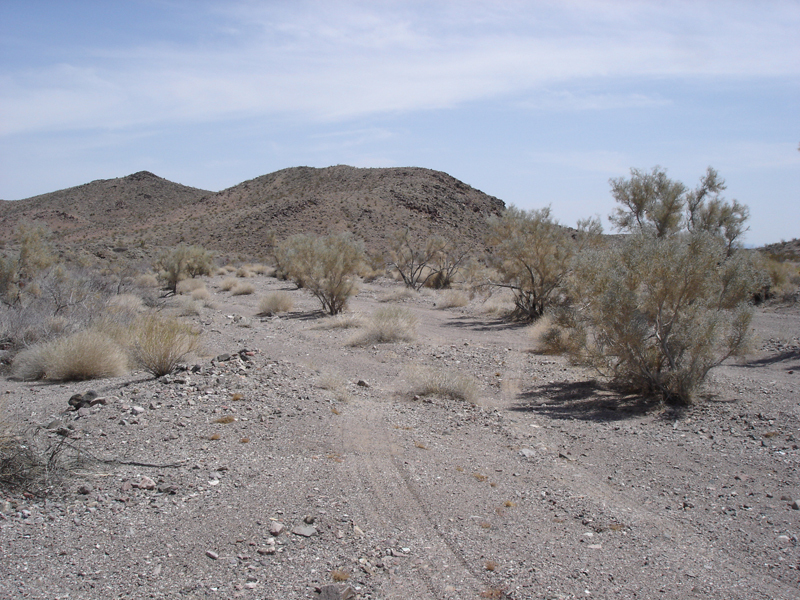 As I made my way out of the wash I had driven up, the wash sediment gave way to a desert pavement surface. 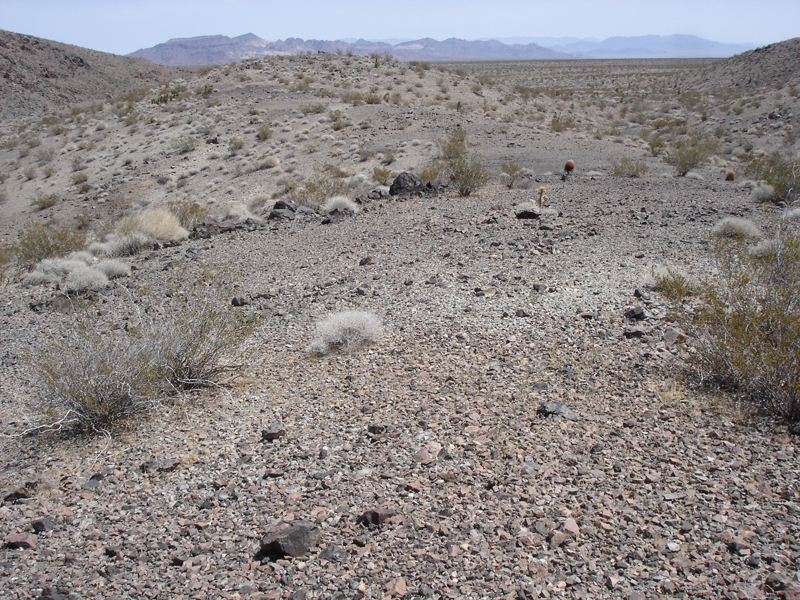 Wind (and occasionally water) carries away smaller sediment particles, leaving a patchwork of rocks behind. 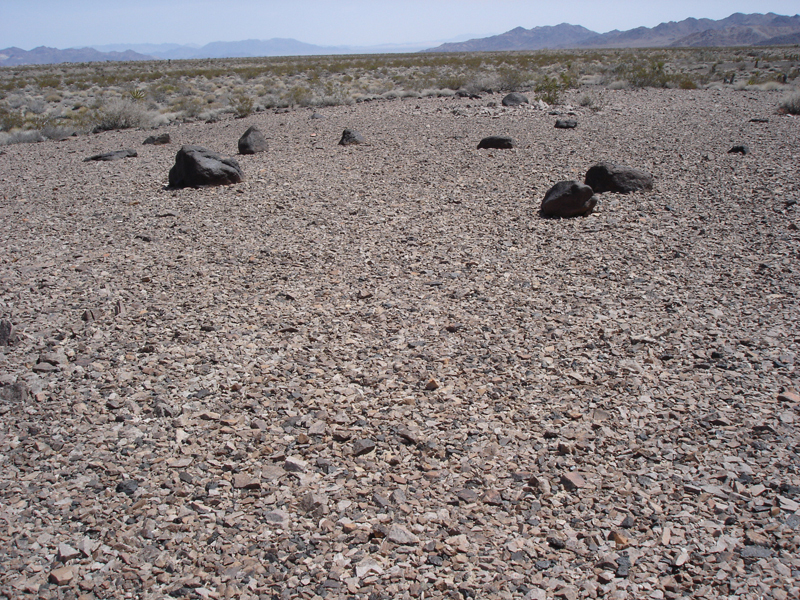 This was the surface I was after, and why I wanted to come here with a detector; spotting a meteorite by eye alone here would be tough. With the detector swinging and my eyes searching I would have a better chance. I hunted along the ridges and found hot rock after hot rock. I was happy to be finding hot rocks! 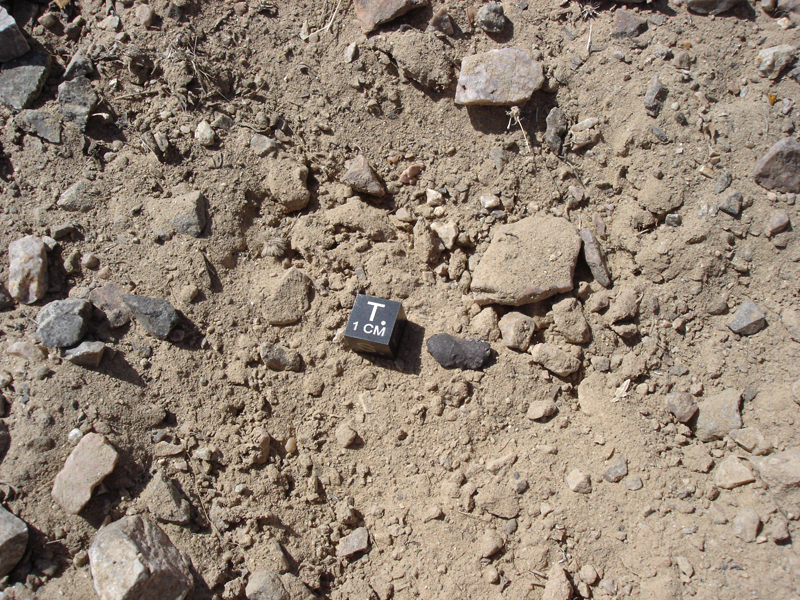 A "hot rock" is a terrestrial rock that makes the detector squawk either due to its mineralization or metallic content. 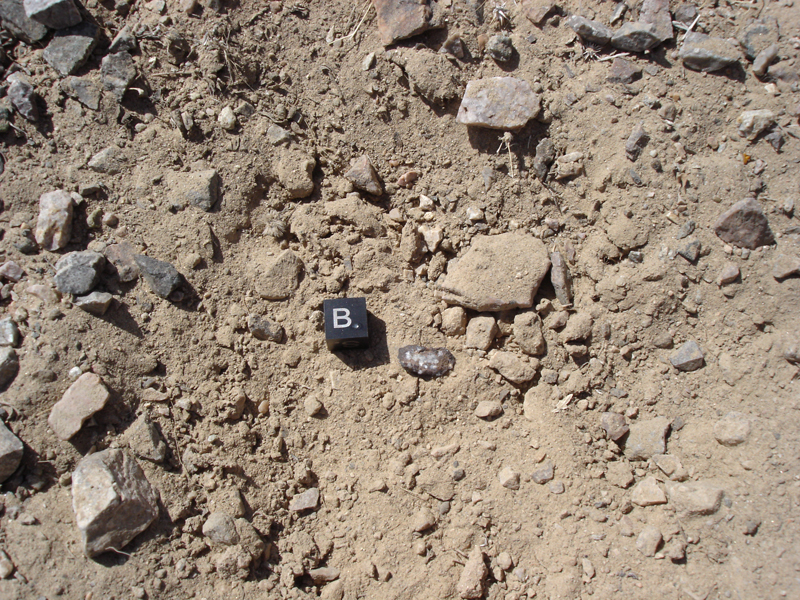 Most of the hot rocks I found out here were dark, glossy basalts, but I was happy to be finding them because that told me that I had this detector set up correctly, and you're not going to find a meteorite if you can't even find a hot rock! I would follow each ridge to where it ended, trailing off into a wash. 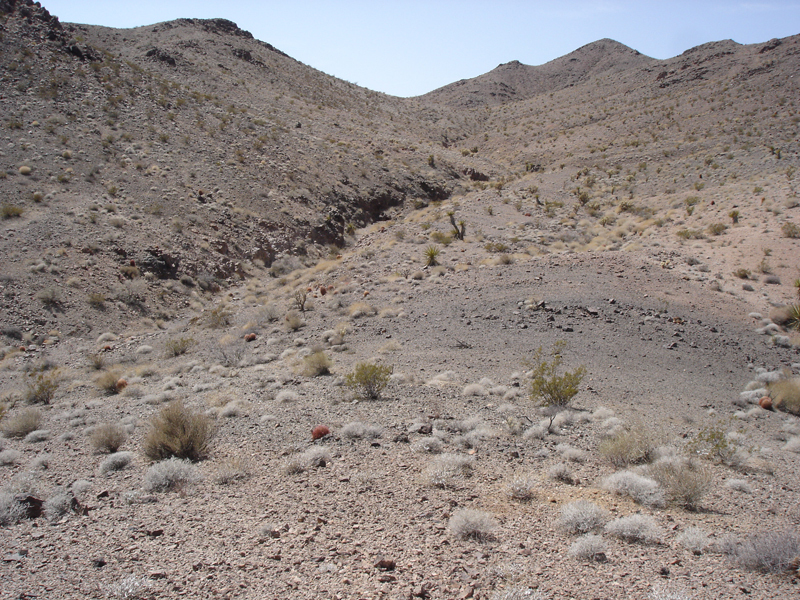 I spent some time down on the flatter alluvial areas, too, but did not hunt any of the wash bottoms. Plenty of open space to swing that detector! I found a small scorpion spending his day under a rock I turned over with my boot, and a few lizards crossed my path, but other than that there was nothing around for miles. 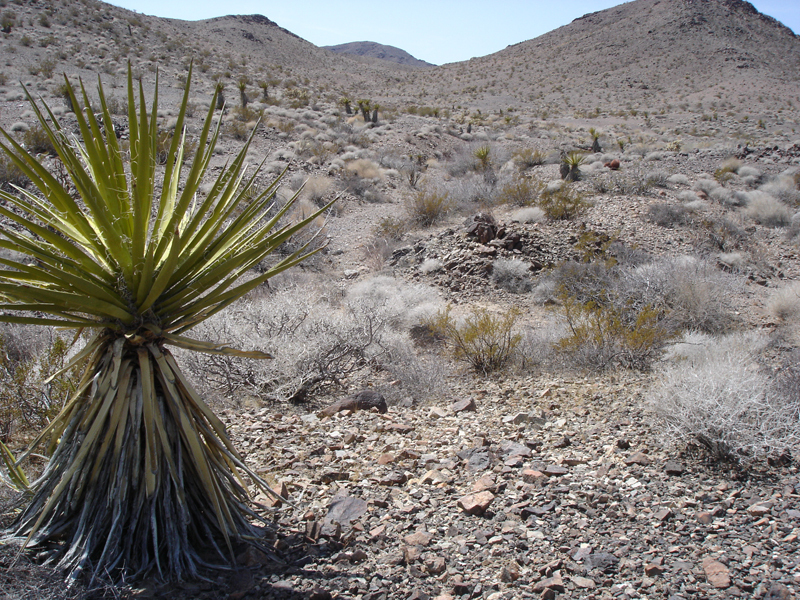 The yucca were the tallest living things out there besides me. Not much shade to stop and enjoy lunch under. Click for full-sized panorama. You can just make out trucks on I-40 in the very left of the photomerge. One of the deeper washes I came across at about 12' deep. Shortly after crossing the wash above it was getting to be about time to turn back and head to the truck. Just then my detector went ZIP ZIP, and I knew this wasn't another hot rock. I scraped the surface where my target was with my pick and passed the detector over again: ZIP ZIP! I had moved whatever was there, and looking closely I couldn't see anything standing out and couldn't pick anything up with the magnet on my pick, so I grabbed a handful of dirt and waved it in front of the detector coil. However, any time my gloves had dust on them they would set the detector off, so I carved up an empty water bottle and made a plastic scoop (which I was actually out shopping for earlier in the week but never found one...) and began passing scoop fulls of dirt in front of the coil. After about 6 scoops I finally had whatever the target was in my scoop, and the way the detector was singing I either found an iron meteorite or some other piece of metal. I poured dirt out of the scoop until all I had was the target, and I thought to myself, "Wow, I just found a small iron meteorite!" But when I brought out my magnet I was surprised to find it had no stick at all. I flipped my GB2 to Iron Disc. mode and waved the target by the coil and got a strong signal. It turned out to be a piece of lead from the tip of a bullet. I marked the spot on my gps, anyway. Here is the hole it came out of, it was in the top 1-2cm of surface material. Upon returning home I was able to determine that the bulk density of the find is 9.28 g/cc, corresponding to that of lead. I filled in the hole I dug and headed back to my truck. I found two old, rusty nails on the way back. All and all I had a very successful day and a great first outing with my metal detector. I can see this becoming an invaluable tool and can't wait to put it to use again.